The Peanut A-Grade Teak Dining Chair has a classic design that is casual and perfect for summer outdoor dining. The rounded back and tub style chair are features that make it inviting and relaxed. The vertical slats give it a nautical vibe which is always timeless. This premium grade-a teak chair is perfect for residential and commercial use. It is extremely well built with thick pieces of teak, this gives a strong and good weight that is definitely not flimsy. Create the ultimate teak dining set with several Peanut Chairs and one of our robust and grand teak dining tables. 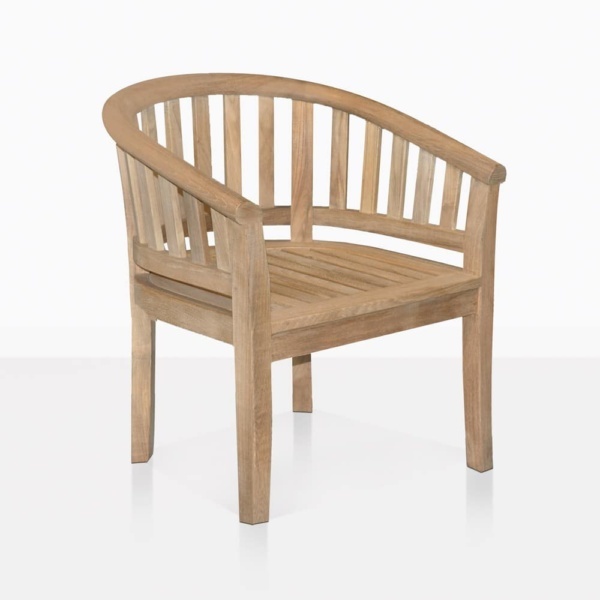 We offer over 157 different styles of outdoor dining chairs to choose from. Visit our massive showroom today to start planning your outdoor retreat.